One of my new years resolutions was to try a different restaurant each month and so far, so good! I've been really inspired to visit new places and try things that are out of my comfort zone. I thought I'd share three restaurants that I recently have discovered and really enjoyed! When uni was over and done with, my friend and I couldn't think of a better place to go to for our celebratory lunch than the Coppa Club in London Bridge! We were lucky enough to go on a sunny day and so it was roasting inside the igloos! As it got warmer they removed the plastic covers of each igloos and it was much nicer! As there was just two of us, we shared the igloo with two other pairs, luckily we had the igloos to ourselves for quite a while before others came in. You have to book the igloos in advance as they do get booked up pretty quick. I was surprised that the prices were not too expensive and that our total came to around £20pp, including drinks. We did, however, only get a few starters to share and dessert. I think it's a nice place to go with family or a group of friends. Although I find this restaurant a little overpriced for what it is, the food and the concept is really good. They bring your desired cut of steak over on a piping hot stone block at its rarest form and you choose how you well done you want it. You have your seasoning and your sauce in front of you (depending on the cut you go for) and once you're happy with how well its cooked, you remove it from the block and eat away! I love the idea of it. The place can get quite stuffy with the smoke in the air, but it's something different! I've only had tapas once before coming here so I don't really have much to compare to! I went to the Canary Wharf branch and on that Saturday evening it was pretty quiet! (also, the nearest station is Westferry on the DLR). We took advantage of the 3 items for £14 deal and each choose 3 items. In total we had 9 different dishes to try from, which was perfect! The food came within 5 minutes of ordering and whilst I'm usually not one to complain about food coming quickly, I was hoping for a bit more of a delay so I had time to enjoy my cocktail before I began my meal. 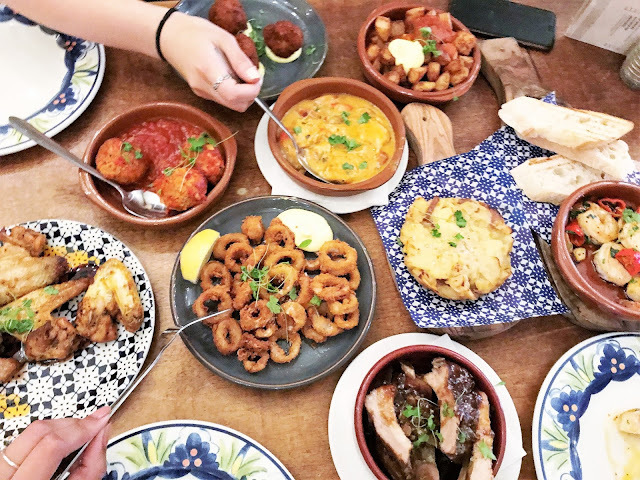 The dishes we tried were: Calamares, Gambas Pil Pil, Pollo con Chorizo, Croquetas De Pollo, Sticky Chicken Wings, Albondigas, Pedro Ximenez Pork Ribs, Patatas Bravas and Tortillas. My favourites were definitely the Croquetas De Pollos, Calamares and the Ximenez Prok Ribs! What restaurants have you recently discovered? ooo all these places look like they have yummy food! I need to check out La Tasca I love a good tapas place!